Stake & Grill: from burgers to brats, coffee to tea; this is the way to cook when camping. Our locking handle easily slides up and down the stake to adjust the heat on your meal and also allows the grill to easily pivot away from the fire for loading and unloading of food. Hot dogs don’t roll off with our up turned edge, and our grill is heavy duty enough to perk your pot of coffee. This product is designed for many seasons of use. Up turned edges keep even hot dogs on the grill. Adjusts on stake to desired heat. Nylon bag included to keep grill neat and tidy. These items are securely stored in a heavy duty nylon bag to keep things neat and tidy. 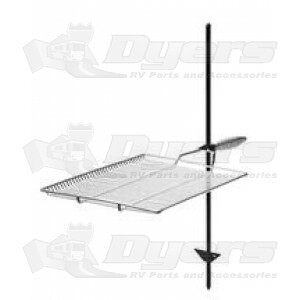 Our Stake & Grill measures 15” wide x 22” long and includes a 36” long stake. Camco Sponge Ring 4" x 3"